During the last two years, I have had three tornadoes pass within a mile of my house. I figured it would be in my best interest to find out more about tornadoes and I am sharing some of my findings with you. I am not an expert in this area, but I did find some interesting facts about tornadoes. 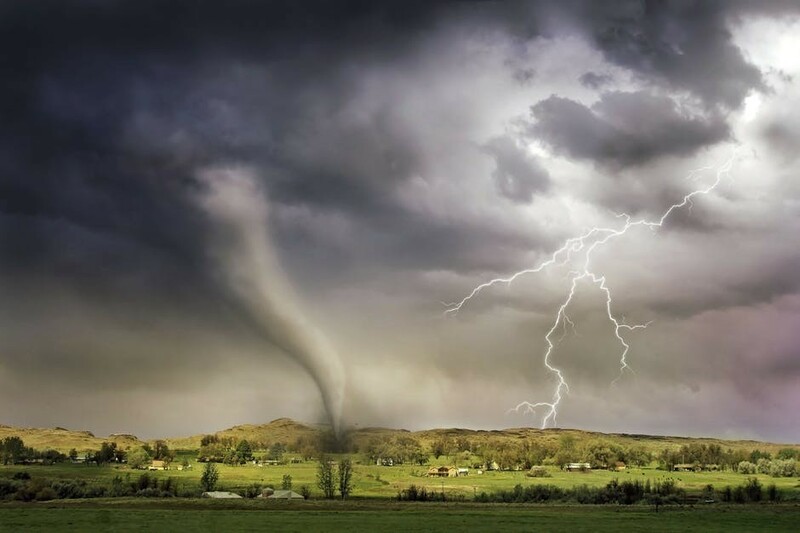 Tornadoes are some of the most misunderstood events of natural weather phenomena. They can be some of the most powerful and destructive forces of nature man has ever witnessed. 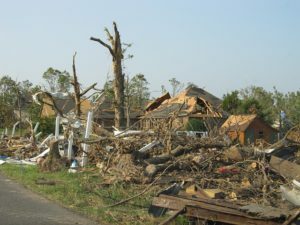 There is still so much that we do not know about the cause and actions of a Tornado. Facts usually mean things that we can prove. Most of the science we have about tornado models is a result of computers, that in the span of time haven’t been around for that long. When it comes to predicting tornadoes most of what we know we gathered from historical observation for patterns. It is pattern models the computers look for, that help warns us to the dangers of tornadoes. The United States of America ends up playing host to more tornadoes than any other country. We average around 1,000 to 1,200 a year. The reason for this happens to be the cold, dry Canadian air likes to cause havoc when it dances with the warm moist air from the Gulf of Mexico. This is why the Midwest and southern states tend to have more tornadoes than the northeastern states. Tornado Alley as it is affectionately called spans the Midwest to down south, and seems to follow the flow of the jet stream. Enhanced Fujita Scale measures wind speed and likelihood of damage of a particular tornado. The scale started in February of 2007 and it assigns an EF (Enhanced Fujita) number to tornadoes. The range from EF0 to EF5 is from weakest to strongest in intensity. Tornadoes are a force of nature! The National Weather Service is in charge of issuing warnings when atmospheric conditions look like they could produce tornadoes. When weather is severe it increases the chances of a tornado. Weather warnings come from the TV, radio, and finally tornado sirens. There are other services offered to the members of the deaf community. Weather radios with flashing lights and a message screen can be purchased, but they are becoming more and more obsolete by smartphones that the deaf community can receive the same emergency text messages as everyone else. Tornado watch- This warning is issued when the atmospheric conditions are right for the forming of tornadoes. This is the warning when there could be a tornado. Tornado warning- Issued when the Doppler radar detects cyclonic action in a thunderstorm or clouds, or if a weather watcher has spotted a funnel. This is the warning when there is a verified tornado sighting. Tornado emergency- This is a term coined in 1999 by weather forecasters to mean a large tornado is moving into a heavily populated area. 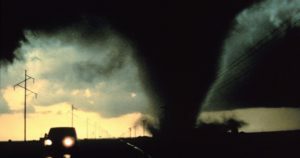 Large amounts of damage and fatalities are considered likely with this type of tornado. Weather changes hourly in the Midwest. We always joked in Missouri that if you didn’t like the weather just wait an hour, it will change. Keep watch on the days forecast and when there is bad weather expected, avoid situations where you would be left defenseless against the storm. Watch for the warning signs listed before like hail, greenish skies, rushing wind, flying cows, and chicks named Dorothy. The sheer destructive nature of a tornado makes it impossible to rage against and win. Another interesting fact about tornadoes are, you can not drive your bug out vehicle into the storm and expect to come out of it unscathed, much less alive. It is like trying to play chicken with a train. There are a few things you can do to prepare for a tornado. Have your everyday normal prepping stockpile on hand in case of a tornado that misses your house but cuts off needs like lights and gas. When choosing a place to live, pick a house with a basement or storm shelter. If you buy a house without a basement put in a storm shelter if possible. Have access to gloves, eye protection, chainsaws, trucks, and manpower for cleanup. Have as full of a tank of gas in your vehicle during storm season as possible. Buy flashlights to use during a power outage as gas leaks can happen during a tornado. Practice an emergency plan with your family for what to do during or after a tornado. Get to the lowest point of the house. Drive away from the storm if possible. Get out of the car if not going to be able to avoid the tornado. If outside try to find a safe place inside a home or storm shelter. Leave a mobile home. It is safer outside. If stuck outside in a field, lay flat on the ground in the lowest point possible, and cover your head with your hands. If the house has no basement lay in the center of the house or in a bathtub with a mattress over yourself. Avoid the Southwest corner of your house. It most likely would be the first side of your house to be hit by the tornado or debris. Avoid parts of the basement directly under major appliances like a refrigerator in case it comes through the floor. Avoid shelves or other items that could fall on you. Light candles as there can be broken gas lines. Look out or try to open windows. Avoid flying glass. Take selfies with the tornado. Use elevators as you can become trapped with no electricity. Stay in your car. The vehicle can be thrown and flattened. Stand up in the house. Get as low as possible. Enter unstable structures. Leave that to the professionals. Tie up phone lines with non-emergency calls. One of my parent’s favorite stories to tell about me is the time we were all in the basement with a tornado going by. I must have been two years old. I was praying out loud, “Dear Lord, Don’t let the tomato get me!” To this day, that tomato has not gotten me. Let me know what you think I left out, or share your own experiences with me in the comments section below. This article is awesome. You can tell straight off this isn’t just a post from somebody who wants to earn cash on the back of others tragedies. It comes from someone who has grown up surrounded by this kind of thing. This website is full of information. Not only that it goes even deeper to the sky and the colour changes. That just makes what seems to be a bad situation taken from the true observer. This site is awesome and I have to share it with my family also who live on that side of the world. I could even help them now from my side of the world too. This is brilliant and real eye opener. Absolutley brilliantly thought out website and not for gains neither its like a massive giudance we could all do to know after all thats what we are all about. Especially if we have family in those areas. I like to be kept informed. Awesome post and so looking forward to more of your Articles. I am glad you enjoyed it. Like all the other articles, I hope it was food for thought. Make sure to check back as new articles are being added all the time. For me what you have been given as hints is normal, I’m so interested in it that I know these things, but probably the majority don’t. Also what is bad nowadays that probably when there’s a tornado, they want to have a picture, you know, social media, but it could be a killing selfie.. Literally. What I would do is flee. Far away and look it in the distance. Thanks for sharing this life-saving post! Last week I saw a post about a group of duck hunters that took selfies and video with a tornado coming at them. They were in duck boats on the side of the lake. Lucky for them they did not come into direct contact with it but it did make for a viral photo shoot. It is very hard to predict which way a tornado is going to go. I’ve really enjoyed reading this article on “Interesting facts about tornadoes” as you’ve provided us with tonnes of valuable information. You’ve mentioned that its better to stay out of the house somewhere in an open field. Is it possible for a tornado to lift up a human being from the ground? What if we get lifted up and thrown away? If you are in a mobile home they want you to leave the house because it takes less force to knock it over than it does a house built on a foundation. When you are outside you should try to find a suitable building or shelter to go into. If it is not possible then the next thing to try is laying in a ditch. Get to the lowest point you can possibly get. The visual to get here is try to be the dust bunny hiding from the vacuum best you can. Yes a tornado can easily lift a human and throw them. Laying flat on the ground will give the storm a lot less surface area of yourself to be influenced by the rushing wind. Another thing to consider is avoiding underpasses as the air can get trapped by them and actually spin faster. You don’t want to get launched out from under one. I hope this helps! from the 90s when I saw the film Twister, I have always been fascinated by these weather phenomenons. They are beautiful as much as they are deadly. We are fortunate in Europe not to have to deal with such storms however what we are experiencing is and increase in extreme weather conditions. Working in Offshore Renewable Energy, we are seeing stronger winds and storm forces as a destinct sign of our changing weather patterns. Is the USA also seeing an increase in Tornadoes and more importantly, the intensity of such storms? When researching tornadoes I did not come across any information saying that we were having an increase. When talking about storms caused by global warming, people always seem to point the finger at hurricanes as proof of global warming. I have heard it stated that they think the severity of the storms is a direct result of such things. Be careful if that is the case if you are working off shore. wow, I am sorry that happened to you. You know first hand that it is nothing to kid around with. These types of storms should always be taken seriously and avoided as much as possible. This is interesting . I must commend you for taking your time to share this vital information on Tornadoes, you must have done a lot of research. This is a life saving post, honestly if almost everyone can read this beautiful article, we will be aware of how to protect ourselves from this disaster. This is not just a random post but an educative write up, I will start following you to get more updates. Wow! Every constituents of this write up spells experience and fact. It showcases it is a honest analysis and advise and not just a Cooked up story to attract people to their website. Everything you shared concerning tornadoes is true. Though, I know about some of the hints and what to do but I just got enlightened on what ought not to be done. My only view is just about the ignorance of most people who loves to rule the social media by capturing live events, doing this closer to a tornado can end a life so quickly. Get away as fast as possible and lay low. This article, in particular, was designed to be more informative with facts. Some emergencies have facts that will help with being prepared. Hope you found something useful in it. There are a lot of natural disasters that occur on a regular basis and tornadoes are among those that are really disastrous. It is something I pray to never experience because of all the stories I have heard about them. I see news and watch movies and feel extremely sorry for those that have either lost their lives or their loved ones or even their properties due to this event. Nothing can be done to stop it which is why it is called a natural disaster. All we can do is cope with it and follow instructions that can help us survive it. I really hope those that have to face this won’t lose more than their properties. I think tornadoes are so horrible because of the unpredictability of their movements. At least with something like a hurricane they can warn people of the path. Not so with a tornado. Thanks for stopping by and leaving a comment. I am from Africa so I have never experienced a tornado before, still it scares me silly all the way from where I live. I read alot of books and watch movies and I’ve seen the dangerous nature of tornadoes. Most times tornadoes are inescapable, if they so choose to pass over your home, but being prepared can save your life if not your properties. I find it weird that something like a tornado only really happens in certain places of the world. I am glad that you do not have to deal with it. Thank you for stopping by and the comment. Nice, thank you very much. I tried to find out the facts so that people can make the best choices if they are ever faced with a tornado. Maybe it was able to give people food for thought on the subject. Thank you for leaving a comment. This article is exceptionally full of helpful information. I really love the sincerity of the admin. I must commend you for taking your time to experience every action to revealing these hints on Tornadoes. Although have not experienced it before, but have seen the occurrence on TV and heard it from it occurrence from so close relative in other countries. Of all the hints, avoiding the Southwest corner of your house is the most amazing one I seems not to heard before but is an added knowledge. All these information here are great and enough to save life. Thanks for sharing this. I am very pleased that you found value in it. It would be great if this information helped someone stay alive through an experience like that. Mostly, I just want to help raise awareness.